For beginning bread bakers, it's typical to start with a basic white loaf that allows you to get a hang of the process. When you're ready to move on to something a little more interesting, try this turmeric-basil rye bread recipe. 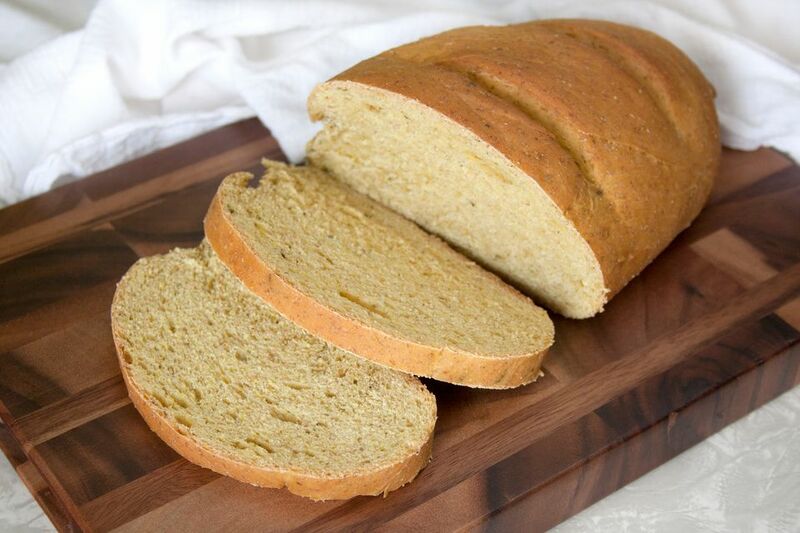 It can easily become your family's new every day loaf. The beauty of this recipe is that it's just as easy as any white loaf. The flour has simply been divided to find a good balance between white flour and a whole grain rye flour. You get the benefits of a darker bread, without the need for any special ingredients like the sourdough starters that are common in other rye bread recipes. As an extra bonus, this recipe enjoys the light flavoring of turmeric and basil. The turmeric adds a very faint ginger-pepper flavor and gives the bread a light yellow color. Similarly, the basil adds a nice herbal taste. Just because the bread is spiced, doesn't mean it isn't versatile. This recipe can be used for any of your favorite ways to serve bread. It's great for a sandwich at lunch; is a nice side with dinner when topped with whipped butter; and it makes amazing grilled cheese. It's also surprisingly tasty when used for sweeter meals, like peanut butter and jelly sandwiches or French toast. One of the tricks to making consistently good bread is to weigh the main ingredients. A digital kitchen scale does not cost much and it makes measuring much faster and more accurate. It's recommended to use the weight measurements for the water, milk, and the initial flours in this recipe. In a large mixing bowl, add the warm water. Slowly add the yeast, stirring constantly until it is completely dissolved. Mix in the salt, sugar, olive oil, shortening and milk. Stir in 1 1/2 cups (200 grams) white flour, along with all of the rye flour. Add the basil and turmeric. Continue adding white flour 1/4 cup at a time and stirring it in until the dough follows your spoon around the bowl and it can be kneaded by hand (about 1/2 cup flour total). Place dough on a lightly floured board and knead for 10 minutes. Add more flour as needed—no more than 1/8 cup at a time—by generously sprinkling it on the dough and board when the dough becomes too wet and sticky to work. You will use more flour at first and less toward the end. Add only as much flour as needed to get a silky-textured dough that bounces back when poked. This should be around 3/4 to 1 cup in total. Grease a clean mixing bowl with spray oil, place the kneaded dough inside, then flip it over so it's greased on both sides. Cover with a towel and let it rise for 1 hour. While you can place this bread into a loaf pan, there is no need for it. These steps are written for a free-form loaf that can be baked on any flat baking pan. The resulting bread will have the look of an artisanal bread from the bakery and can be used just like any other loaf. Your sandwiches won't have that signature shape, but it tastes the same. Gently shape it into a mound, cover with a towel, and let it rest for 15 minutes. Gently knead the dough for about 1 minute until it becomes more of solid ball. If needed, add just a sprinkling of flour to keep the dough from sticking to the board and your hands. To shape the loaf, roll out the dough to about 1 1/2-inches thick (two times with the rolling pin, with one flip in between is just about perfect). Beginning on one of the long sides, roll the dough up like a jelly roll. Pinch the bottom and end seams closed. If the dough is a little too dry, dip your fingers in water and try pinching again. Place the loaf on a greased baking sheet and cover with a towel. Allow the bread to rise for 30 minutes, cutting three slashes on the top after 10 minutes. If your oven has a convection option, use it to ensure the bread gets baked evenly. For this, the oven temperature should be 350 F (if your oven doesn't convert it automatically) and the cooking time should not change. Bake the bread for 40 minutes, or until the crust is golden brown. Allow the bread to cool for a couple hours before slicing or storing it. Since this bread recipe includes a dark flour and has no preservatives, it is important to store it properly. At room temperature, it will keep for about two days. Slice what you think you will eat in that amount of time and store the excess in the freezer. To freeze bread, wrap the loaf in plastic or freezer wrap and store it in a plastic freezer bag. When you need more, allow about one hour for it to thaw before slicing. Storing bread in the refrigerator is not recommended as it can dry out rather quickly. This bread recipe also works very well with whole wheat flour and you can use the same amount as indicated for rye flour. Also, you can use either all-purpose or bread flour. Bread flour contains extra gluten, which will help the bread rise, but a perfectly good loaf can be achieved with regular all-purpose flour. Have fun using this recipe to play around with other combinations of herbs and spices, or skip them completely for a simple rye bread. Oregano, chives, thyme, and rosemary are good choices for herbs and can be added a pinch at a time. Fresh herbs also work well when you have them, just be sure to chop them as finely as possible. For spices, try paprika.